For comparative purposes, we are currently working on adding the UN conferences in the field of Disarmament, including the United Nations Conference to negotiate a legally-binding instrument to prohibit nuclear weapons, leading towards their total elimination. The study, financed by the European Research Council (ERC CoG, iBias), builds on research conducted by Jan Beyers and Marcel Hanegraaff, a project financed by the Research Foundation-Flanders (Odysseus Program, 2009-2014). Beyers and Hanegraaff have built a unique data-source which maps the entire community of transnational advocates who attended the climate conferences (1995 until 2009) and the MCs (1995 until 2011). This work has been published in prestigious journals such as Comparative Political Studies, Global Environmental Politics and World Trade Review. The current project aims to improve and enlarge the existing datasets with stakeholders that were active at the more recent climate- and trade-conferences. In addition, we focus more closely on how non-state stakeholders interact with policymakers at the international level. Through on-the-spot interviews with representatives of NGOs, business organizations, government services and other stakeholders that are present at the MCs and COPs, we seek to analyze how interest groups try to exert influence. This project runs from 2015 until 2018 and we plan to conduct two interview rounds at all three venues. Each interview round will be followed by a websurvey through which we aim to collect additional data among non-state actors and policymakers who we could not talk to during our fieldwork. Innovative about the approach is its policy-centeredness. 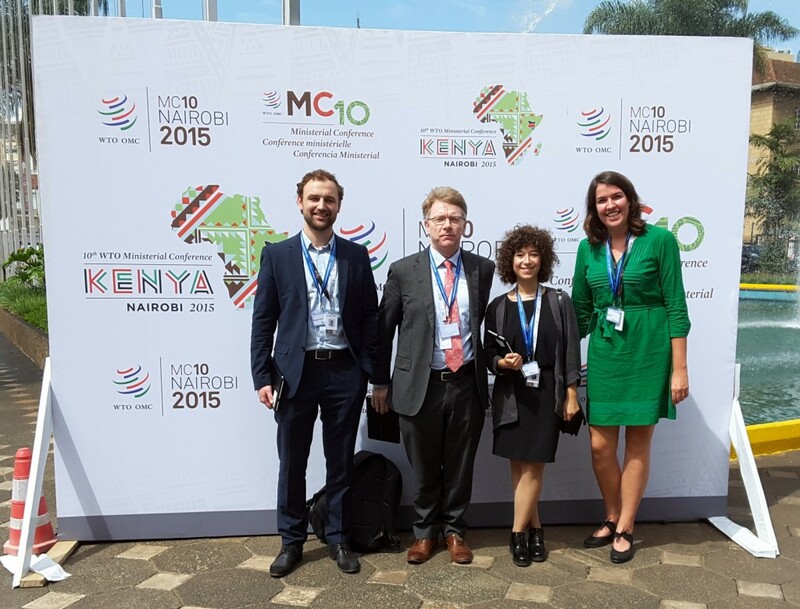 For the first round of on-the-spot interviews held in December 2015, we identified 15 issues that were on the negotiation agenda of the WTO and the UNFCCC. 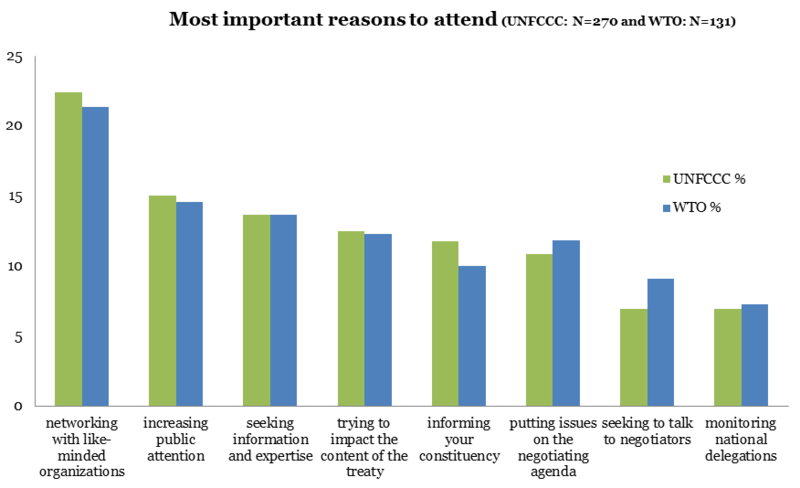 Non-state stakeholders were asked about their reasons to attend the conferences and it appears that networking and communication with the general public are most important (see figure). Interestingly, seeking to influence the national delegation or talking to negotiators is much less important. In addition to this we collected data on policy positions, the strategies used to get their position heard by policymakers and how much policy influence non-state stakeholders estimated they had with regards to these issues. Besides, we also asked policymakers about their interaction with interest groups and their assessment of the influence of non-state stakeholders. Through analysing this rich body of data, we expect to develop a better understanding of whether and how non-state stakeholders succeed in influencing international policymaking.